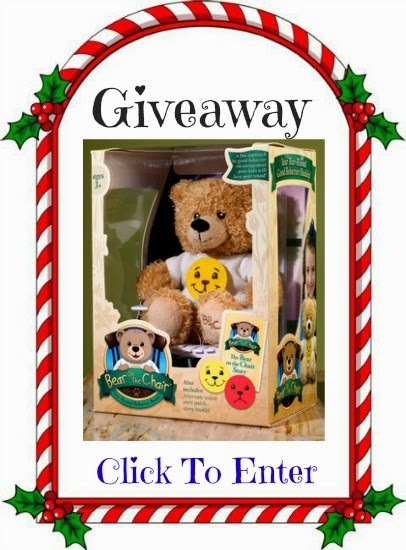 If you are considering getting a cute cuddly toy for your special little angel, check out the latest great find from the PR Friendly, Holiday Gift Guide 100+ Bloggers. And you could win one for free by following the link at the end of this post. Good luck! Parenting is filled with challenges and decisions around every corner that could have a profound impact on your child. Having tools and options to make parenting more effective is something that can enhance a child's happiness and quality of life during critical stages of development. One of our most satisfying experiences with positive parenting has been with the creation of Bear on the Chair by our daughter Symonne. Parents have found our bear very useful in their ability to motivate their children to brush their teeth, eat vegetables, and follow instructions when they are given. There is something the child finds extremely comforting in communicating with the soft and responsive bear. Parents and children alike really appreciate the story that comes with the bear, which sets an energetic tone for how positive reinforcement will be used. The story gives the child a sense of imagination and wonder that assists in the usefulness of Bear on the Chair and positive parenting. Children are amazed to see their very own adoption certificate and are thrilled to have a new cuddly and friendly behavior buddy in the house. Parents and teachers have shared how easy it was to see how having help in motivating children can be more effective and more enjoyable for parents and assists in the child learning empathy and making positive improvements in their behavior. Bear on the Chair offers a chance to give toddlers positive reinforcement, reduce tantrums, and give parents something to feel confident and positive about in the home. Bear on the Chair can help children with Autism and ASD by offering an outlet for communication and expression that is comforting and reassuring. One lucky person will win a Bear On The Chair®! Disclosure: I received no compensation for this publication, but will receive an entry for a blogger only giveaway.